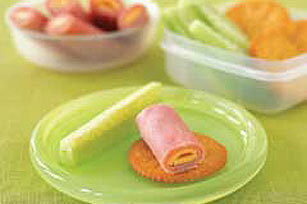 A cheesy ham roll-up, RITZ Crackers and cucumber spears are delicious fillers for an insulated lunch bag. Place Singles on ham slice; roll up. Cut roll-up in half. Place in airtight sandwich container. Place crackers and cucumber in separate airtight containers or resealable plastic bags. Pack all containers in insulated lunch bag. Serve with 1 pouch (6.75 oz.) CAPRI SUN FRUITWAVES 100% Juice Apple Splash and 1 small banana. If preparing the night before, refrigerate filled containers until ready to pack in the lunch bag.